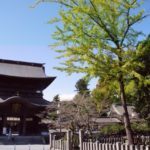 Located in Kyushu region, Kumamoto is famous for its great collection of local foods! 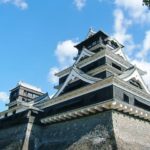 Today we’ve listed up 10 local foods that you should try when visiting Kumamoto! 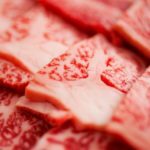 Aka Beef is one of the most famous types of beef in Japan, and is famous for its delicious and high quality meat cuts. The beef doesn’t have too much fat on it, and has very soft texture. 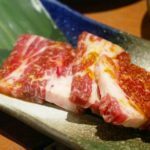 You can try Aka beef at the restaurant, and we strongly recommend you to visit and try the yakiniku at Farm Restaurant Tangoyama to try fresh Aka Beef. Enjoy not just the Aka Beef, but also fresh vegetables and delicious rice at Tangoyama! Kumamoto’s Amakusa is famous for its delicious sea urchin. In Kumamoto, you can enjoy many different types of sea urchin such as: purple sea urchin (March to May), red sea urchin (July to September), and long spine sea urchin (January to June, and October to December). Every year, from March 11 to May 14, many restaurants and izakaya bar hold Amakusa Sea Urchin Fest, as this period is the only time you can enjoy all of Amakusa’s sea urchins at the same time. We strongly recommend you to visit Amakusa Jizakana Ryori Ikesu Yamamoto for its superb sea urchins dishes. This restaurant only serves fresh caught sea urchins only, so these urchins have very smooth textures and sweet taste as well. Kumamoto is famous for its delicious brown sugar donuts stick, which is manufactured by Fujibambi, a famous Karinto (Japanese traditional snack) manufacturer in Kumamoto. Brown Sugar Donut Sticks are Fujibambi’s new products, which main ingredients are similar to Karinto’s ingredients. These donut sticks use Okinawa’s brown sugar and local flour, and deep fried with fresh vegetable oil. You can find these donut sticks at Kumamoto airport and major stations in Kumamoto. In addition to these donut sticks, you should try the purple yam donut, Aso Jersey milk donut, and finger size honey donut as well! In addition to Hakata Ramen, Kumamoto Ramen is also one of the most famous ramen noodles in Kyushu. 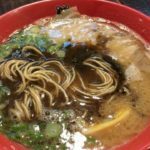 Kumamoto Ramen has very strong flavor and fragrance, as it has uses garlic oil, spicy oil, and fried garlic as the seasonings. This ramen also uses the chicken broth and pork broth, creating very bold ramen soup. We strongly recommend you to try Keika Ramen if you want to try the real taste of Kumamoto Ramen! Chikuwa Salad is one of the most famous local foods of Kumamoto, which was invented for the first time by a housewife 40 years ago. Chikuwa Salad is a chikuwa (Japanese fish cake) tempura with potato salad filling, which is very simple, but delicious. Obento no Hirai is the most famous manufacturer of Chikuwa Salad in Kumamoto, and this shop sells more than 6,000 pieces of chikuwa salad everyday. In addition to the potato salad filling, you can also try chikuwa tempura with crab stick or asparagus filling as well. Matches perfectly with a glass of cold beer, why don’t you visit Obento no Hirai for its superb Chikuwa Salad? Ikinari Dango is one of the most traditional sweets, and also one of the most famous Japanese sweets in Kumamoto. 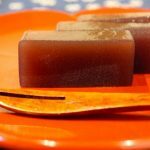 Ikinari Dango is a steamed sweet potato wrapped with sweet red bean paste and flour dough. Ikinari means “sudden” in English, and the dango was named as Ikinari Dango because people can easily make and quickly serve this dango, which also makes this dango a perfect treat for the unexpected guest. We strongly recommend you to try the Ikinari Dango at Higoya, which are made in slightly different style compare to the conventional Ikinari Dango. Visit Higoya and try its exceptional Ikinari Dango when visiting Kumamoto! 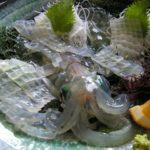 Hitoyoshi is a city in Kumamoto, and you can find a famous unagi (eel) restaurant there. 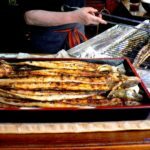 With more than 100 years of history, Uemura Unagiya serves one of the best unagi cuisines in Japan. At this restaurant, you can enjoy Unaju (Eel rice box), Unadon (Eel rice bowl), steamed unagi, and special Unagi lunch/dinner course. The unagi at Uemura is very crispy on the outside and fluffy on the inside, and marinated with a special sauce. Make sure you stop by Uemura for its delicious unagi dishes! Taipien is one of the most famous local foods in Kumamoto, and it can be considered as Kumamoto’s soul food as well. Taipien was invented for the first time in China and somehow this dish became famous in Kumamoto. Taipien is a soup dish consisting cabbage, pork, shrimp, and squid; boiled together in pork and chicken broth, and you can find Taipien not only at the Chinese restaurants, but also ramen shops and at the hotels as well! We strongly recommend you to try Taipien at En En, a famous Chinese restaurant in Kumamoto. If you love spicy food, we suggest you to try En En’s spicy Taipien as well! Hitomoji no Guru Guru is one of the most famous local dishes of Kumamoto. 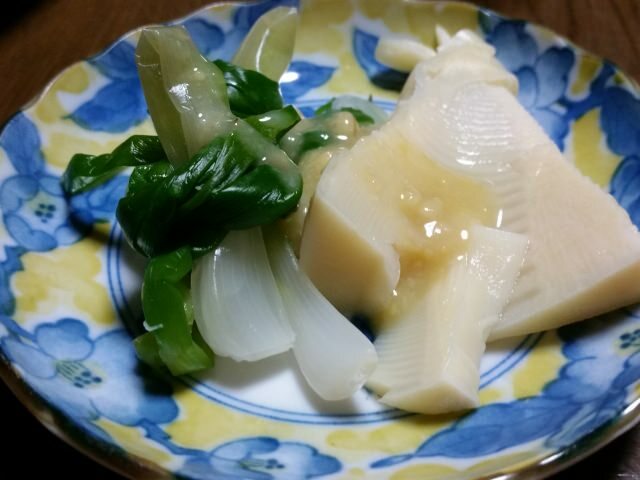 Hitomoji is a type of leek, and Hitomoji no Guru Guru is a boiled Hitomoji served with miso sauce. Hitomoji no Guru Guru has a very long history, as it was invented for the first time in Edo period. We strongly suggest you to try this dish at Kobouzu, a famous oden and yakitori izakaya in Kumamoto! 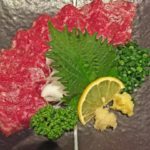 Eating horse meat is a kind of culture in Kumamoto, and horse meat has been consumed by people in Kumamoto for more than 400 years. Horse meat has less calories and fat, but more protein compared to beef. 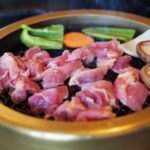 Horse meat is very famous among the ladies, and in Kumamoto, horse meat is served as steamboat dishes, shabu shabu, yakiniku, & steak. We strongly recommend you to visit Uma Ryori Tenkuni for its delicious and fresh horse meat dishes. 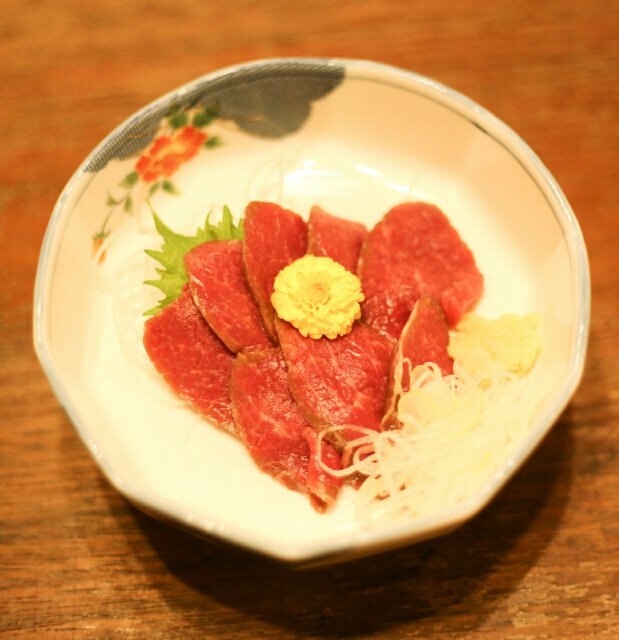 Tenkuni only uses the finest and the freshes horse meat; you can even enjoy eating the horse meat sashimi at Tenkuni! 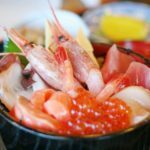 Let’s eat special local gourmet dishes in Kumamoto! Kumamoto is not only famous for its great sightseeing spots, but also for its delicious local foods as well. 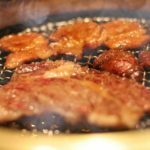 From local sweets to horse meat, don’t forget to try one of these local foods when visiting Kumamoto!